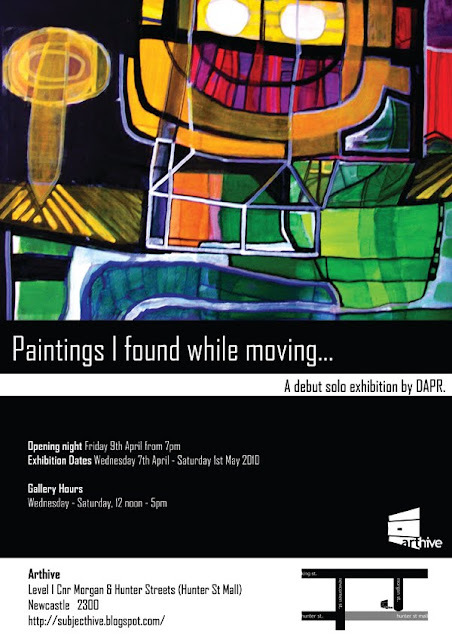 Arthive is proud to present the first public viewing of works by DAPR. Paintings I found while moving is an exhibition showcasing extraordinary talent by a hidden artist. It took some convincing but we got DAPR to agree to share these amazing paintings. Curated by Jenna Gill, this exhibition is not to be missed. Coming up on April 3, Melbourne experimental act INFINITE DECIMALS will launch their new album 0.18232323... in Newcastle at the ARThive, accompanied by live projections by Paul Rodgers. Also performing are local improvisers CRAB SMASHER, who will launch a new mini-album titled The doctor is in... over his head, and Sydney artist SCISSOR LOCK, who you may recall performed at our fundraiser show last July. Line King is is an exhibition by Chris Brown, a local photographer and installation artist, featuring a collection of his latest black and white photographic works, and a large, detailed, geometric installation made of over 10 kilometres of string.